I've been diligently working on a new quilt top. Even Mr. Squash claims my head has been buried in my trusty Bernina lately. The quilt is Stephanie's Wringer Washer. I'd been dying to make it with my new fat eighth bundle of Blueberry Crumb Cake by Blackbird Designs. First, let me say that this fabric is my new all-time favorite line! I just love the soft colors and lovely prints! The other day I finally got the quilt top finished, but as I sewed on the last border I realized I had made a huge oversight of my own. I won't go into details, it's too embarrasing, but suffice it to say I had to do some major ripping! Here is the quilt in it's ripped state. I will be making some more adjustments after which I can finally sew the whole thing back together! I used Moda's Primitive Muslins as the solids surrounding the small blocks - you can see that they blend perfectly! This will be so cute once it's quilted and bound! Ever since we moved into the Squash House I've had lighting issues in my studio. The room has windows north and east which don't provide for the best natural light. 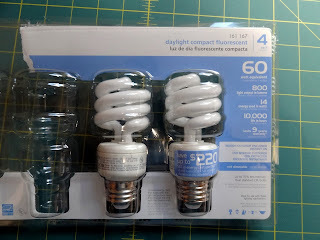 At some point we're going to have a Solatube installed in the room but until then I have continued to struggle with good light --- that is until I saw these at Home Depot the other day! There is an overhead in the room with two 60 Watt bulbs. I replaced them with these and voila - let there be light! I'm just tickled that I can finally get a good look at what I'm doing, not to mention reduce the strain on my eyes! If you have the same problem - do give these a try! A good light makes all the difference, doesn't it? Maybe our eyes won't age faster than the rest of our bodies! There's always hope!! Will the new lights help you see your mistakes before they happen? Now that would be the perfect lightbulb!! Love the quilt! And the blueberry crumbcake is so totally yummy. 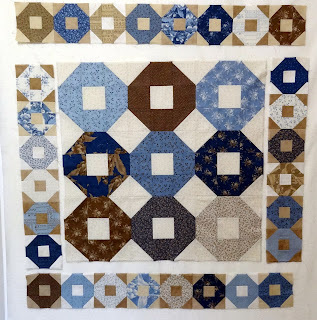 I love your quilt and the Blueberry Crumb Cake fabrics are really pretty (a few of them live with me!). The fabrics are perfect for this pattern Candace. The older I get, lighting becomes more of an issue...rats! My windows are north and east, too. I am working on lighting solutions and will follow along on your journey. I hate to rip....sorry you had to but your quilt looks wonderful. I had to eat my last blueberry chocolates after I saw your quilt! Good light makes life so much easier.